I haven't had the time or effort to code much lately - the job's taking up most of my daytime and I'm usually too tired to code when I get home. But I've managed to dedicate a couple of hours the last couple of days to try and make some advancements on Soulreaper. Lately I've been thinking about the possibility of making the game 3d. I've not decided to go with this option though - I'm just checking out the possibilities. 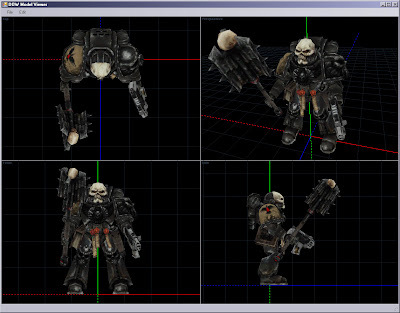 As a part of this, I've removed the dust from my old project of hacking the DoW texture, model and animation formats, and added texture preview capabilities to my model viewer.